"Pacific Rim" -- What We Know About The Super Secret Giant Robot Flick! 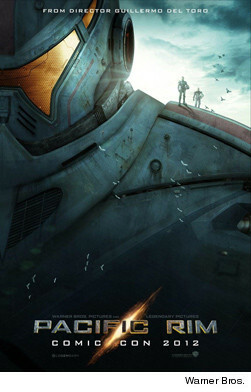 "Pacific Rim" is being touted as one of the must-see movies of 2013, but very little about the sci-fi flick has been made public ... until now. Not since "Cloverfield" has a film been shrouded in such secrecy. The brain child of director Guillermo del Toro ("Pan's Labyrinth"), "Pacific Rim" depicts the war between mankind and massive monsters called Kaiju. Giant robots called Jaegers have been created to combat the new threat. The Jaegers require two pilots, connected by a neural bridge, to operate. Fans at Comic-Con got a glimpse of both the Kaiji and Jaegers in action -- and it was impressive. The footage showed the gigantic beasts destroying full cities and a bridge similar to the Golden Gate, engaging in combat with the equally huge robots. The director, who also helmed "Hellboy," is no stranger to creating monsters, and the creatures he's come up with here are incredible. del Toro says there will be nine different Kaiju in total terrorizing humans, including sea monsters. The scenes of destruction may bring flashbacks of a certain giant lizard destroying Tokyo, but del Toro is quick to dismiss comparisons. "I wouldn't compare it to a 'Godzilla' film. These [creations] were part of my nutritional make-up growing up." Coming up with an original world was incredibly satisfying for del Toro. “There are things in the movie that I’m proudest of that I’ve ever made and part of that is because of the way it was designed and who I collaborated with." During the press conference, the lead actors gave us more insights into their roles. Charlie Day plays Newt Gotlieb, who he describes as an everyman who "can't fight his way out of a paper bag" that gets caught up in the war. Ron Perlman's Hannibal Chow is a black market dealer who sells parts of fallen Kaijus to wealthy collectors. "I have no morality. No moral compass." Ron also revealed that he shares every scene with Charlie Day. The lead character, Raleigh Antrobus, is portrayed by Charlie Hunnam. Raleigh is a pilot who suffered a great loss. "Rinko and other people bring me out of retirement." Opposite Charlie is Japanese actress Rinko Kinkuchi, who plays Mako Mori. Mako has suffered a tragedy of her own. Together, Raleigh and Mako overcome their personal pain and pilot a Jaeger together. "Two people that are really hurt can become one," del Toro describes of their relationship. Of course, the Jaegers will are major characters as well. "I wanted each robot to have a personality and for you to feel when the robot gets hurt or when the robot wins," del Toro explained. "I wanted very much to make the audience feel for those machines." Each robot will have a specific look, name and country affiliation. For example, the Jaeger from China is called Crimson Typhoon. 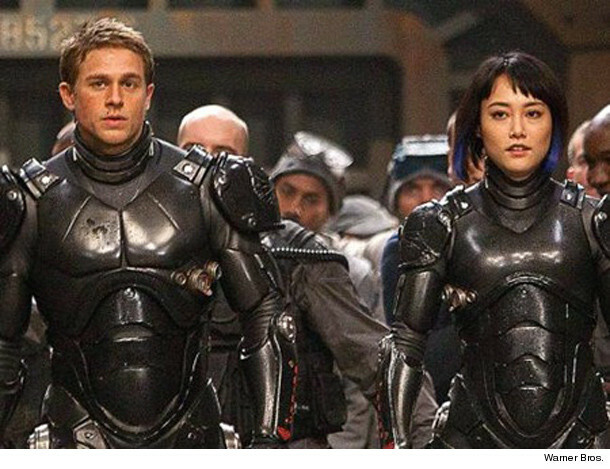 The name of Raleigh and Mako's Jaeger was not revealed, but Charlie Hunnam said it "coincided, coincidentally, with a sub-category of society I've been obsessed with." His answer was intentionally cryptic, and we can't wait until July 2013 to find out what it is!